THE THRILL OF THE CIRCUS! Stilt walkers that are worthy of the big top and are available for all occasions. Meet Francesca & Finnius as these Ringleaders bring all the atmosphere of the circus to you! 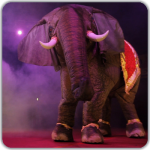 A life sized elephant wandering through your event with a Circus Showgirl or Ringleader stilt character. Almost Tame is a highly interactive act that moves through events engaging all those around them. A trio of Circus Ringmaster and his out of control lions. Circus themed entertainers who bring endless fun. Available as a solo, duo or trio. Almost Tame combines stilt walking performance with two ground based lion characters who are highly engaging. Almost Tame is available with an optional giant sized chariot which the Ringmaster 'rides' in. Almost Tame are a fun act with an infectious energy. Stilt Walkers Australia love the circus and are happy to create any act or concepts you may imagine if you don’t see what you are looking for here.